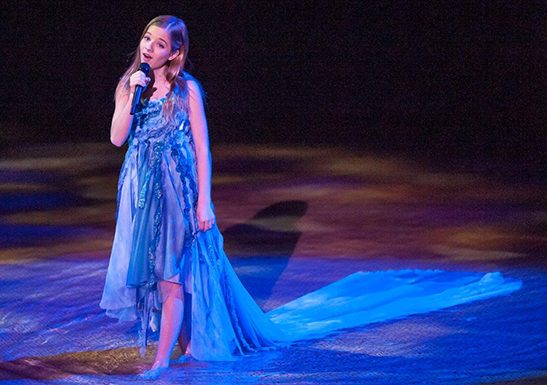 Ehkzu Artzu: Jackie Evancho--star or burnout in the making? Child geniuses: What happens when they grow up? "I'm very serious and very dedicated," she says. "It is like a swan on water: there's a lot of paddling underneath." Her drive, she says, was her own. "The number of young people I've met with somebody speaking for them, literally forcing them to do this... I am lucky. I have a very inspiring and supportive family." As a child, she always wanted to do more practice and play more; it was she who had to push her teachers. "It's funny, the mentality of England is often, 'Let's just keep everybody at the same level', rather than assisting individual needs." But of course some geniuses have terrific parents, as Jennifer Pike says she did. Parents who realize the truth of what Blake said centuries ago: "One law for lion and ox is oppression." For children who have some species of genius, a regretted childhood is one that suppressed the full expression of that genius. Genius children are not miniature adults, to be sure. But they aren't "children" in the normal sense of the term, either. Parents who rise to the challenge of having a genius child are those who carefully navigate between the Scylla of exploitation and the Charybdis of ignoring how different their child is. Jackie Evancho's genius is that of an entertainer who sings. I don't know whether she's particularly talented in other areas. As a singing entertainer it's easy for specialists in classical voice to overlook the overall effect of her total package on her audiences--or to airily dismiss it as yet another child prodigy/future burnout. Likewise the doyens of pop music ignore her completely--what she is, is invisible to the editors of Rolling Stone magazine and suchlike. She's not an opera singer, not a pop singer, not a child singer (because she neither sings like a child nor comports herself like one when she's singing--no mugging), not one of those autistic mimics who simply replicate someone else's voice. She is a classical crossover singer, but that's a muzzy category with no established canon. And other CC singers don't have the effect on audiences that she does. Most of her admirers are not musically sophisticated, though some clearly are--including many of the professional musicians and singers she has performed with (one singer said she was "gobsmacked" by Jackie's performance. The group that may best grasp what's she's got is other professional entertainers who make their living by standing in front of an audience by themselves (or as a soloist in front of other musicians) and enthralling them. She has performed several times at a charity held for/by Muhammed Ali, with such people comprising most of the audience, and their understanding of what she had was obvious. It's not just operatic singing that she doesn't and probably can't do. Add to that jazz, rock & roll, Tuvan throat singing, Kabuki accompaniment, coloratura arias...many, many areas. She's a specialist. But within her area of expertise--"classical crossover" she's the best of the lot when compared directly with the adults she competes with for CD sales. I've played her music for many people without showing them a picture or telling them anything about her. Some were unmoved, but many were thrilled--and had no idea she was the age she is. I did this because of so many music people saying it was just her appearance/age. I have proven to my satisfaction that it is not. It's something she does with her sound that affects many people profoundly. It's not precisely her pitch sense, her phrasing, her restrained use of portamento (and never to hunt for a high note), her equally restrained vibrato, her buttery tone--though all those are prerequisites. Whatever the mechanics involved are, her secret is her ability to disappear into the music and take the listener with her. She never shows off. She never appears to be communicating "Look at me sing! Aren't I great?" That's the sort of self-referencing performing that keeps many a singer with great pipes from reaching the peaks. Jackie seems immune to this kind of anxious narcissism. Probably because her parents are so grounded, from all reports. To a fan of, say, Frank Sinatra, an opera singer may sound like a congeries of screechy artifices. To a fan of opera, Frank Sinatra may seem like someone whose music is both plebian and kitschy. Each is hearing what the other isn't. A good way to understand Jackie Evancho is to look at her audience when she's singing, and see how many people have tears streaming down their cheeks. What other singer has that effect on people? Will she still have this effect when she's 20? I'd say almost certainly, because she does not depend on her extreme youth today when she's in performance--she doesn't affect today's trendy kid attire as Justin Bieber does, nor does she project "cute kid" affectations in performance. Nor are the bulk of her fans people who are in general fans of child singers. Most appear to not have been fans of anyone before she came along, in fact. That's what they report. As for singing age-appropriate stuff...she never sings anything she isn't comfortable with singing. That, to me, is "age-appropriate." She says in interviews that she has a veto on any song proposed to her, and she doesn't hesitate to exercise it. She's polite but not a pushover. What's appropriate for one person to sing at one point in his or her life could be wildly inappropriate for someone else of the same age. I can understand why someone with refined tastes wouldn't be interested in classical crossover music. My spouse loves it and I didn't hate it, but never wanted to go to a concert of same until Ms. Evancho came along. This has been reported by many other fans of hers. As a very rough guess I'd say maybe half were pre-existing CC fans. Similarly I'm not interested in Country Western music--except for a small number of exceptional artists. Conversely, I love many operas but find many others to be, for me, rather formalistic. My point is that exceptional talent transcends genre. How a piece is performed matters--sometimes as much as what the piece is. For example, my spouse and I recently spent several hours on YouTube (piped through our home theater) listening to the Prelude to Bach's Cello Suite #1 as done by dozens of performers using everything from violincello da spalla to double bass to harp guitar to Baroque cello to modern cello. We were both delighted to find that both of us chose the same rendition as our favorite--by a Taiwanese/Swiss guy I'd never heard of, on a modern cello. And I found his performance and that music as moving as I find Ms. Evancho at her best. I’ve flown to Taiwan (where Jackie performed March 22) a fair number of times, as it happens (it’s the best stopover for flights to Indonesia, where my wife & I go for scuba diving). Even from the west coast of the USA it’s a looong flight. A long flight for us traveling economy class, that is. Jackie, of course, travels first class–the crucial aspect being that her seat folds flat and it’s easy for her to get up and move around the cabin. I’m not saying it’s a snap to travel long distances even that way, but I know my own EconoClass experience is very different. Actually, once my wife & I flew from Heathrow to SFO Business Class (in exchange for getting bumped), and I almost wish we hadn’t. Because now we know what we’re missing! And that wasn’t even First Class. Her performance schedule isn’t as arduous as one might think. She has stated that she spends half of her time at home, even without averaging in her family vacations. And it’s spaced out. And within a given performance she alternates with other perfomers. And her song selections are all well within her actual maximum range, which is reportedly 3 /12 octaves. Moreover, she’s always miked, never belts or even projects strongly. So an evening’s miked performance of easy (for her) songs isn’t much like a “heldensoprano” doing, say, Siegfried. Her father has said his main role with her professionally–besides keeping the exploiters and sycophants at bay–is saying “No” to more performances than she does, and regularly sitting her down–with his wife–and telling her they’re ready to pull the plug on the whole thing if she’d rather resume her former life as an ordinary school child. From all reports they are absolutely in earnest about this. Neither has shown the slightest interest in seeking the spotlight for themselves. Her father has said he didn’t even realize what a great singer she is until he observed her effect on other people. So I’m reasonably certain that Jackie’s life–and the health of her voice–are both in good hands. Enough talented kids have been exploited by avaricious, narcissistic parents that it’s reasonable to be on guard for that. It’s just not necessary in this case. They don’t push her–she pushes them. That’s one of the ways extremely gifted children differ from the rest of us–as Jennifer Pike says, it’s in their relentless drive. congratulation for being a star at such a age of playing inside home..